DRAM is a type of RAM (random access memory) used as the main memory in several computing devices, such as desktop and notebook computers, servers, and high-end workstations. It is the most widely used semiconductor memory used in current generation computers, and offers several significant advantages, such as structural simplicity, very high packing densities (number of bytes that can be stored per unit of chip area), low power consumption, and sufficiently high data read/write speeds. Several types of DRAM are presently available for deployment on various computing platforms, such as home/personal computers, portable computers, and network servers. This type of memory has undergone several innovative technological developments and offers very high price/performance ratios. Manufacturer: Samsung. Manufacturer Part Number: M393B1G70QH0-CMA. Brand Name: Samsung. Product Model: M393B1G70QH0. 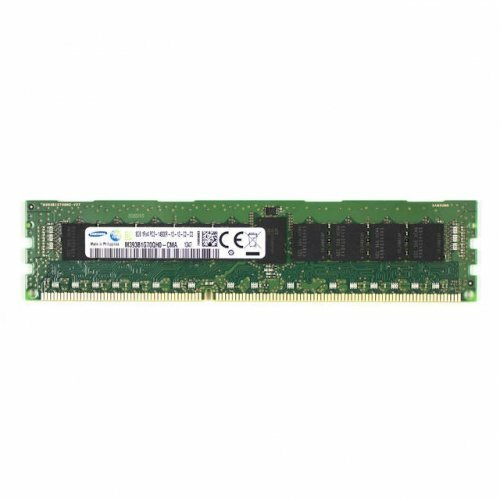 Product Name: M393B1G70QH0 8GB DDR3 SDRAM Memory Module. Package Type: Retail. Product Type: RAM Module. [Technical Information] Memory Size: 8 GB. Memory Technology: DDR3 SDRAM. Memory Voltage: 1.50 V. Number of Modules: 1 x 8 GB. Memory Speed: 1866 MHz. Memory Standard: DDR3-1866/PC3-14900. Error Checking: ECC. Signal Processing: Registered. CAS Latency: CL13. Device Supported: Server. [Physical Characteristics] Number of Pins: 240-pin. Form Factor: DIMM. Width: 1.2".